“We rejoice in our sufferings, knowing that suffering produces endurance, and endurance produces character, and character produces hope, and hope does not put us to shame, because God’s love has been poured into our hearts through the Holy Spirit who has been given to us” (Romans 5:3-5). The College of Bishops of the Anglican Church in North America, which was meeting last week as the ruling was handed down, has issued this statement, focusing on the teaching of Scripture and our Church about marriage. Brian Walsh of our Diocese, President of the Civil Rights Research Center, offers this article about the religious freedom concerns over the ruling. The Rev. Gerald McDermott, also of our Diocese, urges us to continue the battle for marriage here. Ryan T. Anderson writes about the “Four Harms the Marriage Ruling Will Cause” here. And Russell Moore writes that we should “neither cave nor panic” here. Our Chancellor, Scott Ward, will be presenting a free webinar about the Court’s ruling entitled, “Challenges to Religious Liberty,” on Tuesday, July 7 at 2:00 p.m. He’ll be discussing this document, “Practical Tips to Articulate Your Ministry’s Identity and Purpose and to Strengthen Your Legal Rights.” Registration for the webinar is here. The Christian Legal Society is also offering a free webinar on Wednesday, July 8 at 2:00 p.m. on key lessons from the ruling for churches and future challenges related to non-discrimination issues. Details are here. The Court’s ruling came at the end of the Anglican Church in North America’s annual Provincial meetings, this year held in Vancouver, British Columbia. The Executive Committee, the Provincial Council and the College of Bishops met in succession. Please see the article below for reflections by our Diocese’s delegates to the Council and for links to all the reports, videos and other resources. 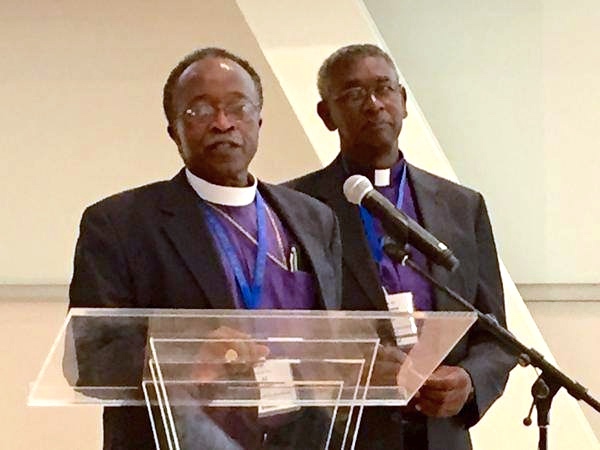 All of us at Provincial Council were moved by Bishops Alphonza Gadsden and William White of the Diocese of the Southeast (Reformed Episcopal Church), who spoke about the horrific church massacre in their city of Charleston, SC. One of the victims, Myra Thompson, was married to an ACNA priest of their diocese, the Rev. Anthony Thompson. It was he who spoke such powerful words to the shooter at his arraignment, offering forgiveness and calling upon him to repent and turn to Christ. The video of Bishops Gadsden and White’s address is here. Earlier in the week, the College of Bishops gave initial approval to new liturgies for Baptism and Confirmation, which will be posted on the Anglican Church in North America website in the next day or two. As with previously released liturgies, churches are urged to use them and offer feedback. Even as we face growing challenges in our culture, I came away from our meetings encouraged by what the Lord is doing in our Church, by the creativity and fruitfulness of mission, and by the depth of commitment to evangelism and discipleship. I’d urge you to read again a powerful article by Scott Ward in the March 19 issue of The Messenger, found here. Scott exhorts us to follow the example of the prophet Daniel and walk through these difficult and painful days with courage, wisdom and integrity. We must never give in to discouragement or fear, but always “count it all joy” (James 1:2) for the glory of Jesus Christ our Lord.